There is a growing tension that will will be seen in the future Enterprise as many of the same technologies that are making it possible for new voices to be heard will also empower the sometimes opposing effect of top-down, centralized management. I have discussed the dynamics of the bottom up communications revolution from a number of perspectives. But in essence what is most important is the recognition that the constituencies of the traditional firm–the myriad stakeholders are being given a new voice What’s more., the transparency of the modern enterprise makes it possible for these stakeholders to see the effect of the forces of competition. They can see and now they have every reason to be concerned. What the empowerment of stakeholder constituencies has done is to create a new democratic force that will ultimately change the dynamics of the traditional hierarchical enterprise. The force of democracy will exert new pressures that will ultimately change historical traditions and strategic priorities for the future. Yet at the same time, technology is making it possible to improve performance in the short term by creating a new age of performance management. Today we live in the era of the smart enterprise as IBM might put it where there are indicators of performance, intelligence about the movement of the operating parts and interoperability among information systems. By creating measures of performance where none have existed in the past, the modern enterprise is going to be able to wire itself to a new performance ethic. Many of the conversations about data and technology are leading in this direction. The Internet of Things and the new capabilities of Big Data analytics are going to empower the power of top down controls at the same time that Information Technology has strengthened the capacity of the grassroots organization to assert new powers from the bottom up. 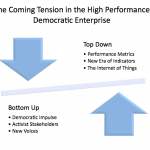 That there will be new tensions within the modern organization as top down meets bottom up. Successful future leaders will build the capacity to mitigate tension and establish decision priorities. There will be times when different, and possibly contradictory priorities are most important to the future of the enterprise.